"This dip tastes similar to a jalapeno popper. 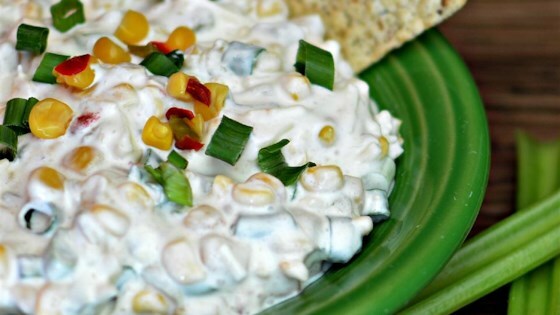 Wonderful with tortilla chips or veggies!" Mix corn, Cheddar-Monterey Jack cheese blend, sour cream, mayonnaise, cream cheese, green chiles, green onion, and jalapeno pepper together in a bowl. If not using immediately upon completion, keep refrigerated until ready to serve. It can be made up to one full day ahead of time. Delicious just how recipe is written but better if sits overnight. With the name jalapeño corn dip, I expected it to be pretty spicy. I think, the spiciness is just right. Delicious dip! I have made it several times now and it always gets gone fast. I like it best with Frito Scoops!! !